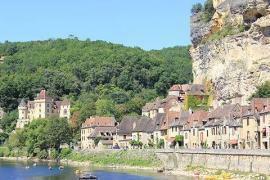 This is a beautiful castle on a rocky promontory, surrounded by a triple wall and terraces, situated above the village of Saint Mondane between Sarlat and Souillac. Fenelon castle dates originally from the 13th century, but the castle we see today is more from the 16th century refurbishments by the owner, an important local gentleman who wanted to live in luxury. 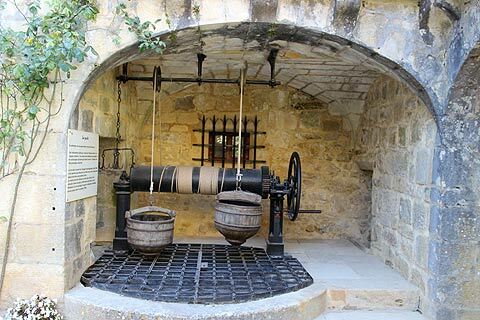 One of his children, Fénelon, was the author of a very celebrated story of Telemachus, much published and read in France during the 18th century. Fenelon castle was a Cathare stronghold during the 12 and 13th centuries and it went on to play a strategic role duing the Hundred Years War. 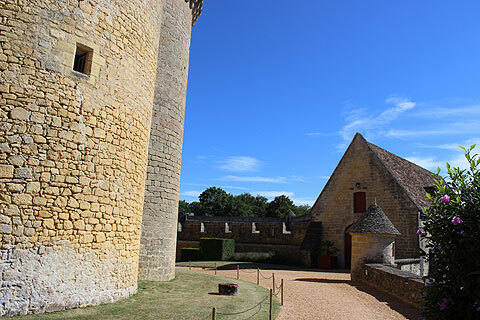 The renovations and refurbishments which took place in the 15th century are in Gothic style and following this more fortifications were added for the Wars of Religion - this was a turbulent time in French history! 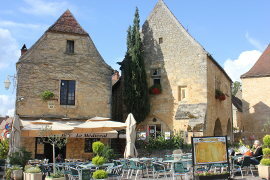 The final key alterations were the addition of a vaulted gallery supporting a large terrace overlooking the Dordogne valley. 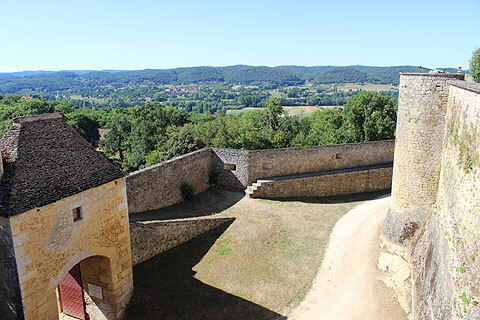 During a visit to the castle of Fenelon you can see the double line of fortifications in front of the castle and another behind it. 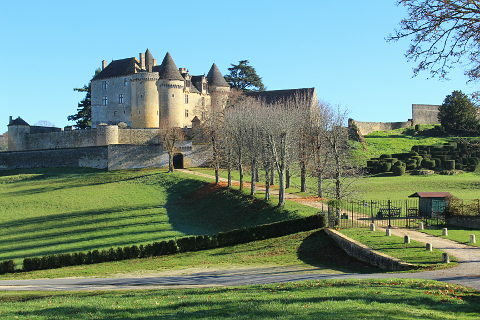 One defensive wall was built in the 14-15th century and the other during the 16th centruy. 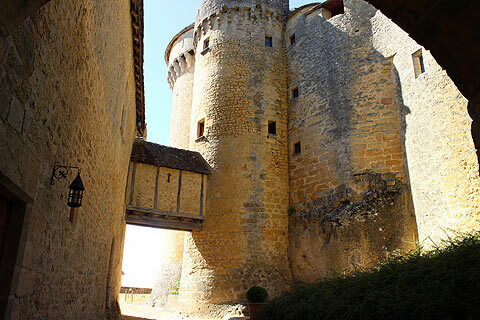 Various towers exist both in the defensive walls and as part of the castle itself. 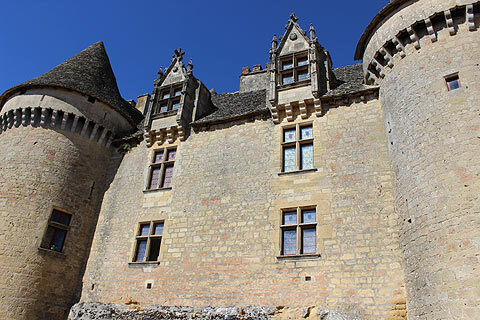 The first gatehouse that you see was built in the 16th century and is heavily fortified as it is the first line of defense for the castle. On the first floor there is a guards room. This gatehouse would have been permanently manned by a guard along with a guard in the little watchtower inside the castle walls. The space in between the castle walls was used by the soldiers for training. There is also a pool of water which was used for riders to wash the horses legs when they returned from hunting and riding. The castle has a different appearance on each side. 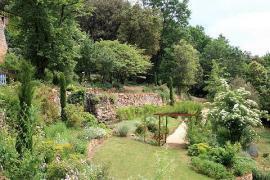 The prettiest is the side with the terrace which also offers some magnificent views over the Dordogne. 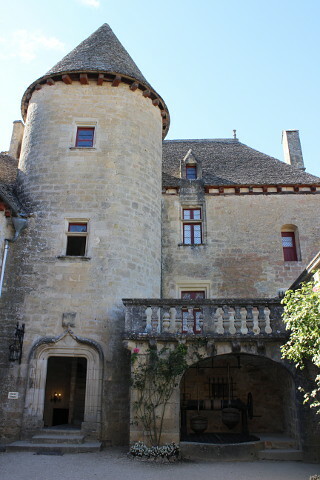 On entering the chateau buildings there is an inner courtyard with a well at one end. 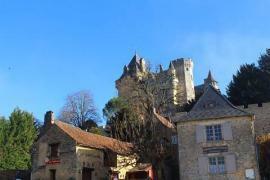 This goes down to a subterranean river and has kept the castle in water since the 15th century. The rooms in the castle are all decorated and give an excellent view of life in the Middle Ages. 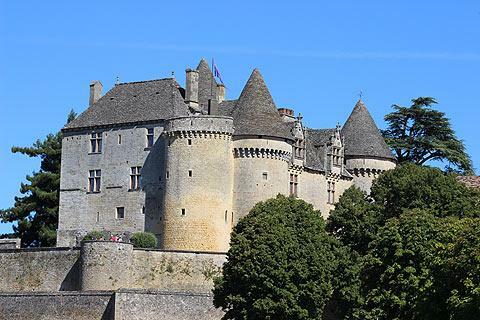 As well as being beautiful on the outside this castle is very attractive inside - the kind of castle you can imagine wanting to live in unlike some of the big, draughty castles around. Inside the castle is a large reception room with furniture and tapestries from the Renaissance, and a collection of arms from the 15th to 18th century. Best of all though are the bedrooms which show how decorating style evolved over time. There is 'La chambre de Fenelon' decorated in the style of Louis XIII's reign, 'La chambre Louis XVI' showing 18th century style with lots of soft furnishings, and then there is 'La chambre 1er Empire' displaying the Egyptian influence on art and furniture. 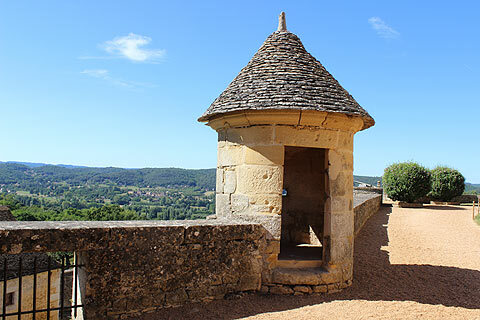 In one of the towers is a chapel and there is also an arms room and a curiosities room. The curiosities room is filled with unusual items brought back from foreign travels by sailors and adventurers. Collecting these was a craze amongst the wealthy in the 16th and 17th century. 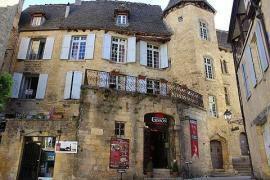 There is another excellent collection at the Manoir de Gisson in nearby Sarlat. The pretty turrets of the roof are covered with lauze stones - a traditional roofing material but increasingly rare because of the high costs involved nowadays in maintaining such roofs. 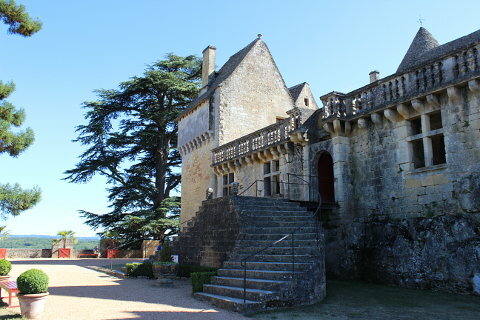 Recent history: the 1998 file 'Ever After' with Drew Barrymore was filmed in the Dordogne including the Chateau Hautefort and Chateau de Fenelon (see other Dordogne films). April, May, June, September: 10.30-12.30 and 14.30-18.30, every day except Tuesday all day and Saturday morning. 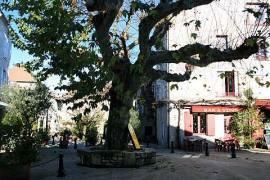 October: 14.30-17.00, every day except Tuesday all day and Saturday morning. Prices are 8.50€ for adults and 5.50€ children. 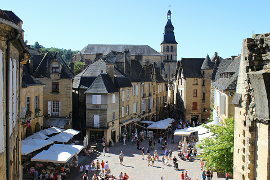 The Chateau de Fenelon is situated between the fabulous town of Sarlat to the west and Souillac to the east. 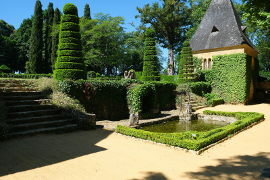 The impressive Jardins d'Eyrignac with their amazing topiary hedges are to the north.